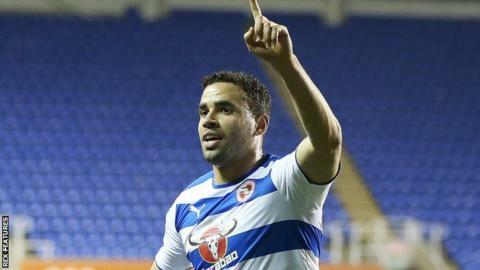 Hal Robson-Kanu's strike was enough to beat Rotherham United and earn Reading a first Championship win in six games. Yann Kermorgant went close for the Royals from Oliver Norwood's corner but his volley was cleared off the line by Joe Newell. Reading led after the break when Robson-Kanu did well to work the ball home from 18 yards. Rotherham almost forced a late leveller as Ali Al Habsi was forced to collect Jerome Thomas's deflected cross. The result means Reading rise to 14th in the table thanks to winning a first Championship match since their 1-0 victory against Bristol City on 2 January. Meanwhile the Millers are now six points adrift of safety and just a point from the foot of the Championship in 22nd place. Brian McDermott speaks to BBC Radio Berkshire after Reading's 1-0 win over Rotherham. "It was an ugly 1-0 win, but we'll take that. A bit of quality has won it. But that win is as important as Saturday's (versus West Brom). "We have come out of the wrong side of those results over a long period of time. We're now getting the right side of those results. "There's 46 games in the Championship, you'll get games like that, but the most important thing is to see them through and win them. "We just need to concentrate on the moment that we're in. I just wish we had 24 games to go, not 14." "We have lost it to a mistake and we should know better. That's why we are down there. "We have shot ourselves in the foot. We have given ourselves a chance of getting results in the games, we are just lacking a bit of quality. "I have only been in here for three games, I think I would be on anti-depressants if I'd been here all season." Match ends, Reading 1, Rotherham United 0. Second Half ends, Reading 1, Rotherham United 0. Attempt missed. Jerome Thomas (Rotherham United) right footed shot from the centre of the box misses to the left. Attempt saved. Yann Kermorgant (Reading) header from the centre of the box is saved in the top right corner. Assisted by Garath McCleary with a cross. Hand ball by Deniss Rakels (Reading). Offside, Reading. Chris Gunter tries a through ball, but Deniss Rakels is caught offside. Delay in match Richard Wood (Rotherham United) because of an injury. Foul by Deniss Rakels (Reading). Kirk Broadfoot (Rotherham United) wins a free kick in the defensive half. Corner, Reading. Conceded by Kirk Broadfoot. Attempt missed. Deniss Rakels (Reading) header from the centre of the box misses to the left. Assisted by Garath McCleary with a cross. Offside, Reading. Stephen Quinn tries a through ball, but Deniss Rakels is caught offside. Hand ball by Matt Derbyshire (Rotherham United). Attempt missed. Michael Hector (Reading) left footed shot from outside the box is close, but misses to the right. Substitution, Rotherham United. Matt Derbyshire replaces Greg Halford. Offside, Reading. Hal Robson-Kanu tries a through ball, but Deniss Rakels is caught offside. Attempt missed. Grant Ward (Rotherham United) header from the centre of the box misses to the left. Assisted by Richard Smallwood. Substitution, Reading. Garath McCleary replaces Ola John. Substitution, Rotherham United. Jerome Thomas replaces Jonson Clarke-Harris. Attempt missed. Stephen Quinn (Reading) left footed shot from outside the box is too high. Goal! Reading 1, Rotherham United 0. Hal Robson-Kanu (Reading) left footed shot from the centre of the box to the bottom left corner. Assisted by Yann Kermorgant. Substitution, Reading. Deniss Rakels replaces Oliver Norwood. Attempt missed. Jonson Clarke-Harris (Rotherham United) left footed shot from outside the box is too high following a set piece situation. Attempt blocked. Jonson Clarke-Harris (Rotherham United) left footed shot from outside the box is blocked. Michael Hector (Reading) is shown the yellow card for a bad foul. Foul by Michael Hector (Reading). Greg Halford (Rotherham United) wins a free kick in the attacking half. Attempt missed. Oliver Norwood (Reading) right footed shot from outside the box misses to the left. Assisted by Yann Kermorgant. Ola John (Reading) wins a free kick on the left wing. Foul by Frazer Richardson (Rotherham United). Oliver Norwood (Reading) wins a free kick in the defensive half. Foul by Joe Newell (Rotherham United). Corner, Reading. Conceded by Frazer Richardson. Attempt missed. Kirk Broadfoot (Rotherham United) header from the centre of the box misses to the left. Assisted by Joe Newell with a cross following a corner. Corner, Rotherham United. Conceded by Jordan Obita. Attempt missed. Yann Kermorgant (Reading) header from the centre of the box misses to the right. Assisted by Chris Gunter with a cross. Second Half begins Reading 0, Rotherham United 0.